When you're looking to keep the peace in your community there's one thing you truly need. It's not a nice cup of coffee every morning, although that IS nice... no, what you need is a trusty belt. You might be thinking, "What am I going to do with a belt that doesn't even keep up my pants?" Well, let us tell you because this Police Utility Belt is ready to impress. Does your regular old belt have a cool holster for the very fake toy gun you're going to carry around with you on Halloween? We thought not! Does your regular belt have awesome pockets that fold over where you can keep all your donut money? This utility belt has just that. Okay, so a bum bag can do a lot of this too, but this looks way better. Can you imagine a cop with a bum bag? We didn't think so. Wear this belt the way you want. The pouches are actually detachable! So, move them around as you see fit. 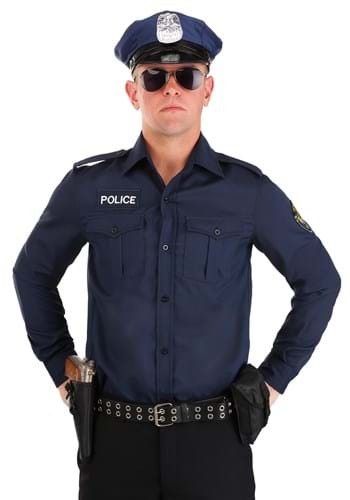 Check out all of our cop and police officer costumes and pair it with this affordable utility belt. Because peace keepin' is always better with convenient storage!